Having been hounded by various parties (Fred and Ewan) it’s time to unveil the 2018 SRA world cup sweepstake! Print off this form and tick one box in each 'pot' (column) totalling 8 countries. Don’t worry, you don't require any particular knowledge of football! The seeding system should make sure you are still in with a chance to win! Ewan and Fred have volunteered to coordinate the sweepstake. Please give your completed form to one of them and your your entrance money of £2. Jonathan will do some work behind the scenes in setting up the spreadsheets and graphs to check progress. Suzanne and Rich are looking forward to the arrival of their new baby boy on 2nd July (or there about!). 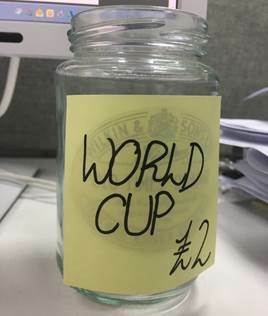 So if you fancy your chances of winning the sweepstake, put on your best guessing head and pay a £1 to Amy. She will collate everybody's answers.